The prevalent renal transplant population presents an opportunity to observe the adaptive changes in the alloimmune response over time, but such studies have been limited by uncertainties in the conventional biopsy diagnosis of T cell-mediated rejection (TCMR) and antibody-mediated rejection (ABMR). To circumvent these limitations, we used microarrays and conventional methods to investigate rejection in 703 unselected biopsies taken 3 days to 35 years post-transplant from North American and European centers. Using conventional methods, we diagnosed rejection in 205 biopsy specimens (28%): 67 pure TCMR, 110 pure ABMR, and 28 mixed (89 designated borderline). Using microarrays, we diagnosed rejection in 228 biopsy specimens (32%): 76 pure TCMR, 124 pure ABMR, and 28 mixed (no borderline). Molecular assessment confirmed most conventional diagnoses (agreement was 90% for TCMR and 83% for ABMR) but revealed some errors, particularly in mixed rejection, and improved prediction of failure. ABMR was strongly associated with increased graft loss, but TCMR was not. ABMR became common in biopsy specimens obtained >1 year post-transplant and continued to appear in all subsequent intervals. TCMR was common early but progressively disappeared over time. In 108 biopsy specimens obtained 10.2–35 years post-transplant, TCMR defined by molecular and conventional features was never observed. We conclude that the main cause of kidney transplant failure is ABMR, which can present even decades after transplantation. In contrast, TCMR disappears by 10 years post-transplant, implying that a state of partial adaptive tolerance emerges over time in the kidney transplant population. This study evaluated how the addition of central molecular assessment to conventional diagnostic assessments would improve our understanding of the rejection phenotypes operating in the prevalent renal transplant population. We developed a sample of unselected biopsies for clinical indications from experienced North American and European centers to reflect the problem of rejection as it presents in the renal transplant universe in the developed world whether days or decades post-transplant. We were particularly interested in the effect of time post-transplant on the risks of TCMR and ABMR in the prevalent renal transplant population as a reflection of host–graft adaptive changes. We prospectively collected 703 biopsies from 564 kidneys between September of 2004 and March of 2012 taken for clinical indications 3 days to 35 years post-transplant (Supplemental Table 1). The common indications for biopsy were dysfunction and proteinuria. The median follow-up after biopsy in functioning kidneys was 2.7 years. Progression to failure (censored for patient death with function) occurred in 128 kidneys (23%) at a median of 1.1 years after biopsy. Kidneys that progressed to failure after the biopsy more commonly presented with deteriorating function, had donor-specific HLA antibody, and were from patients not on tacrolimus–mycophenolate immunosuppression. Kidneys that progressed to failure after biopsy were diagnosed with pure ABMR more frequently (37% versus 11%) and diagnosed with pure TCMR less frequently (5% versus 11%) than those that did not fail. Of 56 kidneys that showed no rejection by conventional assessment and subsequently failed, 5 kidneys had polyoma virus nephropathy (PVN), 20 kidneys had other glomerular diseases, 14 kidneys had atrophy fibrosis of unknown significance, and 3 kidneys had indeterminate findings; 14 kidneys with relatively normal study biopsies also failed (Table 1). Molecular tests gave continuous scores between zero and one but for this analysis, were designated positive using published cutoffs: TCMR score>0.10 and ABMR score>0.20.7–10 These cutoffs diagnosed rejection in 228 biopsies (32%): 76 pure TCMR, 124 pure ABMR, and 28 mixed (Table 2). Of 89 biopsies called borderline by conventional assessment, the microarray tests diagnosed 17 biopsies as pure TCMR, 8 biopsies as pure ABMR, 5 biopsies as mixed, and 59 biopsies as no rejection. The molecular diagnoses strongly agreed with the conventional diagnosis, with accuracy of 91% for TCMR (Table 3) and 83% for ABMR (Table 4). In biopsies assessed conventionally as relatively normal, the microarray tests found no rejection in 97%. The molecular diagnoses differed from conventional assessments particularly in 28 biopsies diagnosed conventionally as mixed rejection: only 6 biopsies had both positive TCMR and positive ABMR scores, suggesting that these biopsies need closer examination (see below). Forty-four percent of biopsies with transplant glomerulopathy had positive ABMR scores. In Cox regression analysis of death-censored 3-year survival, using one random biopsy per patient, kidneys with conventional diagnoses of pure TCMR or borderline changes did not have increased risk of failure compared with relatively normal biopsies (Figure 1A), whereas kidneys with pure ABMR had worse survival than those with relatively normal biopsies. Conventional mixed rejection had increased risk, although there were only 12 patients in this group. Relationship of biopsy findings to subsequent graft survival. Kaplan–Meier curves for 3-year survival postbiopsy for 564 kidneys with one random biopsy per kidney and censoring death with function at 3 years (n is the total number of kidneys, F is failure, and vertical ticks indicate censoring). The total number of patients at risk at various times postbiopsy was 564 at day of biopsy, 498 at day 200, 435 at day 400, 342 at day 600, 273 at day 800, and 241 at day 1000. (A) Conventional diagnosis showing P values compared with relatively normal biopsies. (B) Molecular diagnosis split by ABMR and TCMR scores in pure ABMR (positive ABMR score and negative TCMR score), pure TCMR (positive TCMR score and negative ABMR score), and mixed (both positive). (C) Survival in groups divided by rising ABMR score. (D) ABMR score combined with the conventional diagnosis of ABMR/mixed versus no ABMR. Molecular diagnoses independently confirmed these survival patterns (Figure 1B). Kidneys with positive ABMR scores had increased risk of failure, regardless of whether they had pure ABMR (positive ABMR score and negative TCMR score) or mixed (both positive) rejection. Survival of kidneys with pure TCMR (positive TCMR score and negative ABMR score) was similar to kidneys with no rejection. Each incremental increase in ABMR score from <0.05 to >0.7 was associated with an incremental increase in risk of failure, indicating that the ABMR score provides a quantitative estimate of risk (Figure 1C). The addition of the ABMR score to the conventional assessment improved the prediction of failure in biopsies assessed conventionally as no ABMR (Figure 1D): biopsies with ABMR scores>0.2 or between 0.05 and 0.20 had increased failure compared with those with the lowest ABMR scores (<0.05). Note that kidneys with a conventional diagnosis of ABMR had a high risk of failure, even when the ABMR score was weakly positive (0.05–0.20). We used the Net Reclassification Index to determine whether adding the molecular scores to conventional assessment improved prediction of failure. Adding the ABMR scores to the conventional assessment improved the prediction of 3-year graft survival by 23% (95% confidence interval, 10% to 36%; P<0.001). The addition of conventional ABMR assessment to the ABMR score did not improve risk prediction significantly (P=0.12). For insight into adaptive changes in prevalent kidney transplants, we studied the incidence of TCMR and ABMR activity in biopsies at various times post-transplant (Tables 3 and 4), with boundaries at 7 days, 6 months, and 1, 5, and 10 years. In effect, this groups the biopsies as early (before 1 year), intermediate (from 1 to 5 years), and late (after 5 years). Conventional and molecular assessments gave similar patterns of TCMR and ABMR activity over time. Pure TCMR diagnoses were frequent early on, uncommon between 1 and 5 years, rare after 5 years, and virtually absent beyond 10 years. Positive TCMR scores were more frequent than conventional TCMR between 6 months and 5 years, reflecting positive TCMR scores in some PVN biopsies. Biopsies presenting with ABMR became common after 1 year post-transplant and continued to present through all subsequent times. The molecular scores and conventional diagnoses for individual biopsies over time are shown in Figure 2 (comparing the TCMR scores [Figure 2, A and B] and the ABMR scores [Figure 2, C and D]). Conventional diagnoses are indicated by symbol colors for each biopsy, with TCMR in red, pure ABMR in blue, mixed in yellow, borderline in orange, and PVN in green. The log scale (Figure 2, A and C) shows the early detail, and the linear scale (Figure 2, B and D) shows the late detail. The last conventional ABMR activity was at 31 years (day 11,453), and the last positive ABMR score was at 28 years (day 9889). Relationship between time of the biopsy post-transplant and biopsy findings. Distribution of TCMR and ABMR scores and conventional diagnoses in 703 biopsies by the time of the biopsy post-transplant. Each biopsy is represented by a symbol colored by conventional diagnosis. (A) TCMR scores on a log scale. (B) TCMR scores on a linear scale. (C) ABMR scores on a log scale. (D) ABMR scores on a linear scale. The intermediate time period (years 1–5) is shaded to separate early (first 1 year) from late (after 5 years). The time periods are further divided into intervals: early at day 7 and 6 months and late at 10 years. The striking finding was the disappearance of TCMR from indication biopsies after 10 years post-transplant (Figure 2, Table 5), although some patients in this population were probably nonadherent, which is discussed below. In 110 biopsies after 10 years post-transplant, molecular assessment found 0 pure TCMRs, 34 pure ABMRs, and 1 mixed rejection (a biopsy at 10.2 years [day 3717]). Conventional assessment found 1 pure TCMR, 28 pure ABMRs, and 3 mixed rejections. However, three conventional assessments of TCMR activity after 10 years—one pure TCMR at day 3878 and two mixed rejections at days 4445 and 5985—were on the basis of v lesions and had positive ABMR scores but negative TCMR scores. Thus, in 108 unselected indication biopsies at >10.2 years post-transplant, ABMR activity was frequent—31 conventionally diagnosed and 36 molecularly diagnosed—but no biopsy had confirmed TCMR activity. Because molecular assessment often disagreed with conventional assessment of mixed rejection, we studied these biopsies in more detail (Table 6). Discrepancies were particularly common in the late biopsies: of 14 biopsies beyond 5 years diagnosed conventionally as mixed, all had positive ABMR scores, but 12 biopsies had negative TCMR scores. In 7 of 12 discrepancies, conventional assessment of TCMR activity was on the basis of v lesions, which can occur in pure ABMR.12,13 The others were diagnosed on the basis of tubulitis, which occurs in many progressive kidney diseases and therefore, may occur in pure ABMR.14,15 Thus, most conventionally diagnosed mixed rejection in the late period may be incorrect because of misclassification of pure ABMR caused by the occurrence of TCMR-like lesions in ABMR. 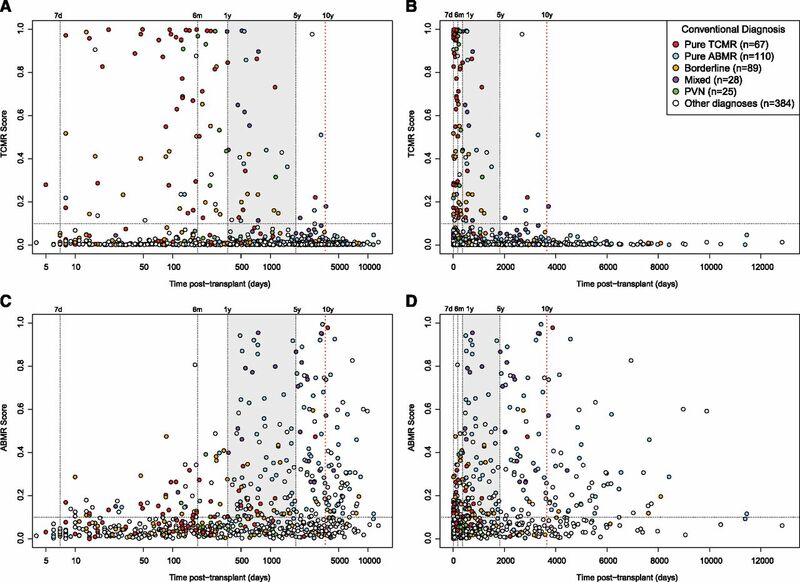 The emergence of a validated molecular system for biopsy assessment provided a unique opportunity to re-examine the disease states in renal transplants in two dimensions. We studied the incidence, timing, and consequences of rejection in a sample of disturbed kidneys biopsied 3 days to 35 years post-transplant in the current era of immunosuppression since 2004 and in experienced centers.27 The molecular tests strongly agreed with conventional assessment (accuracy of 91% for pure TCMR and 83% for pure ABMR), and the pattern of rejection over time was similar by conventional and molecular assessments. Pure ABMR was rare before 1 year but then became common—about 23%–28% of biopsies—with new cases presenting even 30 years post-transplant. TCMR activity was common in the early and intermediate periods but became rare after 5 years and disappeared after 10 years. Some conventional diagnoses of TCMR activity after 5 years were questionable, because they were on the basis of ambiguous lesions that can occur in pure ABMR. Graft loss was increased after biopsy diagnosis of pure ABMR but not pure TCMR, and mixed rejection behaved like pure ABMR. The ABMR score quantitatively predicted risk of failure, and the addition of the ABMR score to conventional assessment improved the prediction of graft loss. We conclude that combining molecular with conventional assessment improves understanding of troubled kidney transplants, confirming many conventional diagnoses, clarifying borderline biopsies, highlighting potential errors, and improving prediction of failure. The unexpected finding that TCMR activity was virtually unknown after 10.2 years, despite continued emergence of new ABMR cases, indicates that all patients with renal transplant eventually develop an adaptive state that precludes TCMR while permitting ABMR. The rarity of pure TCMR after 5 years and its virtual disappearance after 10 years in this collection of unselected indication biopsies occurs despite the high probability that some patients were nonadherent. Medical record reviews in a subset of these patients found that many were suspected of nonadherence by their clinicians, including some presenting late; however, TCMR was absent after 10 years.3 Thus, pure ABMR may be a common presentation of nonadherence in late kidney transplants. Nonadherence is difficult to assess, because it is often denied by the patients, but it will be an important target for research, because it could account for a significant amount of late rejection and graft loss. The absence of confirmed TCMR activity in late kidney transplants is reminiscent of the experience with immunosuppressive drug withdrawal in liver transplantation. Many late recipients of liver transplants can be withdrawn from immunosuppression without TCMR or ABMR, whereas late recipients of kidney transplants cannot be withdrawn safely, with the exception of very few recipients, some of whom have unusual B-cell changes.28–30 The strongest factor determining success of withdrawal of immunosuppression in stable recipients of liver transplants is time post-transplant beyond 10.6 years, similar to the time of the last TCMR activity of 10.2 years in this study. The mechanism of the T-cell adaption in recipients of liver transplants is unknown: changes in natural killer cells31 and iron homeostasis genes32 have been reported, but regulatory B or T cells have not been incriminated,33,34 and the B-cell changes seen in the rare tolerant kidney recipients have not been observed. Our hypothesis is that all long-term organ transplant recipients on immunosuppression undergo partial adaptive T-cell tolerance that depletes their ability to generate TCMR against the graft, while preserving their capacity to generate anti-HLA antibodies and ABMR. Liver transplants differ from kidney transplants (and probably, other organ transplants) in being relatively resistant to ABMR, perhaps because of their large mass, regenerative ability, and unique microcirculation. However, some investigators contend that liver transplants are not as resistant to ABMR as previously believed, because ABMR phenotypes are being missed.35 Disappearance of late TCMR, despite continuing high risk of ABMR, may reflect exhaustion of the precursors of effector T cells needed for TCMR, despite persistence of the follicular T-helper cells needed for antibody responses. The rare patients with kidney transplants who remain stable without immunosuppression must have the universal TCMR adaptive change plus a rare second defect preventing antidonor antibody responses, which are compatible with the B-cell abnormalities reported in these patients. Potential limitations of this study include the focus on prevalent rather than de novo transplants, the lack of protocol biopsies of stable patients, and the reliance on local histology assessment without central review. We elected to focus on prevalent transplants, because it is not feasible to acquire biopsies from kidneys two or three decades post-transplant in a study that begins at the time of transplant, just as the study that discovered the importance of the 10.6-year time point for liver tolerance used prevalent patients. We did not include protocol biopsies, because exposing large numbers of stable patients to regular protocol biopsies for decades is difficult to justify and not the standard of care. Our choice of local diagnosis in experienced centers with excellent diagnostic support as the standard for conventional assessment was on the basis of our experience with central histology reading, which is not the standard of care, offers no mechanism for resolving disagreement with the local centers, and is often incomplete, because local centers are reluctant to share some specimens.9,10 In our view, the local interpretation must be the primary comparator, because it determines management, which is why local diagnosis of rejection has always been the end point for trials of immunosuppressive drugs,36–38 despite inclusion of central histology readings in some studies. The possible role of late subclinical rejection (i.e., with no phenotype) cannot be assessed in an indication biopsy study. Although analyses of large databases have often found that grafts diagnosed with rejection had reduced long-term survival compared with grafts with no recorded rejection,39,40 this biopsy-based analysis indicates that graft loss after TCMR is similar to that after biopsies with relatively normal findings. This does not indicate that TCMR is always benign but only that TCMR is well treated in experienced centers, consistent with recent experience in clinical trials of belatacept, where increased TCMR was not accompanied by increased late graft loss.41,42 The effect of rejection on registry analyses cannot be compared with this study, because registries do not require biopsies. Moreover, rejection recorded in registries can be a marker for conditions interrupting immunosuppression, such as infection or medical illness. In reporting biopsies, the pathologists sometimes noted deficiencies that limited scoring. For TCMR lesions, 10 biopsies lacked scores for tubulitis, 10 biopsies lacked scores for infiltrate, and 30 biopsies lacked scores for endothelialitis (v lesions). For ABMR lesions, 10 biopsies lacked scores for glomerulitis, 23 biopsies lacked scores for peritubular capillaritis, and 12 biopsies lacked scores for glomerular double contours. HLA antibody testing at biopsy was recommended in the study, but the decision to perform it and the method were determined by the local standard of care. Antibody specificities were usually determined by either LABScreen or FlowPRA single-antigen beads (One Lambda, Canoga Park, CA). No testing was reported for 77 patients, and donor-specific HLA antibody was not reported in 11 patients positive for HLA antibody. One extra biopsy core was collected for microarray analysis, placed immediately in RNALater (Ambion, Inc.), kept at 4°C for 4–24 hours, and stored at −20°C until transfer to the ATAGC; 703 biopsies were adequate for microarray assessment, and 59 biopsies were discarded because of improper sample collection. As detailed previously,7–10 the molecular classifiers were built by linear discriminant analysis implemented in the classification function of the CMA library of R using 10 group crossvalidation. The 703 samples were split randomly into 10 approximately equally sized groups, with one group left out as a test set and nine groups used to train the classifier.7 This procedure was applied to all 10 groups. This process was performed 50 times. The median of 50 scores for each biopsy was the final score (between zero and one). The TCMR score classifier was generated by comparing conventional TCMR biopsies with everything else, and the ABMR score classifier was generated by comparing conventional ABMR biopsies (C4d-positive or -negative) with everything else. Chi-squared, Fisher exact, and nonparametric t tests were used to compare variables as indicated in the tables. For Kaplan–Meier survival analysis, we selected one random biopsy per kidney when more than one biopsy was available. For the Net Reclassification Index, the R package survIDIRI was used. P.F.H. has shares in Transcriptome Sciences Inc., a University of Alberta spinoff company to develop molecular diagnostics. This research was supported by funding and/or resources from the Roche Organ Transplant Research Foundation, Novartis Pharma AG, the Canada Foundation for Innovation, Genome Canada, the University of Alberta Hospital Foundation, Roche Molecular Systems, Hoffmann-La Roche Canada Ltd., the Alberta Ministry of Advanced Education and Technology, and Astellas. P.F.H. held a Canada Research Chair in Transplant Immunology until 2008 and currently holds the Muttart Chair in Clinical Immunology. See related editorial, “Begin at the Beginning to Prevent the End,” on pages 1483–1485. This article contains supplemental material online at http://jasn.asnjournals.org/lookup/suppl/doi:10.1681/ASN.2014060588/-/DCSupplemental. Transformation in Immunosuppression: Are We Ready for it?